Protesters supporting Shield's petition outside an Apple store. First of all, Dost isn’t a “group” as was widely reported — he’s just one guy, who sounds like a lot of people we know. A longtime Apple user and “confirmed IT geek” since he borrowed his sister’s ID and went to the local university to try out the APL terminals while in high school, he holds a diploma as an electronics engineering technician and has been in IT since the mid-1980s. He isn’t an Apple fanboy, but thinks Apple has been unfairly singled out among tech companies for its labor practices in China. Nevertheless, Dost sounds like he’s enjoying the challenge. Cult of Mac: This is the first petition you’ve launched on Change.org – have you been involved with the site in the past? Paul Dost: Yes, this is my first petition and I created an account at change.org specifically so that I could start this petition. I was surprised at how easy it was. I didn’t have to provide any proof of who I was or whether my cause was legitimate. Perhaps it is too easy. CoM: Do you own Apple products? Does being a “Mac” or “PC” have relevance to the issue or not and why? PD: Yes, I own a few Apple products. My first exposure was an Apple //e that my Dad bought when I was in high school. I bought my first Mac in 1986 and I have been a satisfied Apple customer ever since. I have used PCs for work all these years so I’m familiar with both sides of this particular fence. This issue isn’t a Mac vs. PC thing at all. It’s about truth. 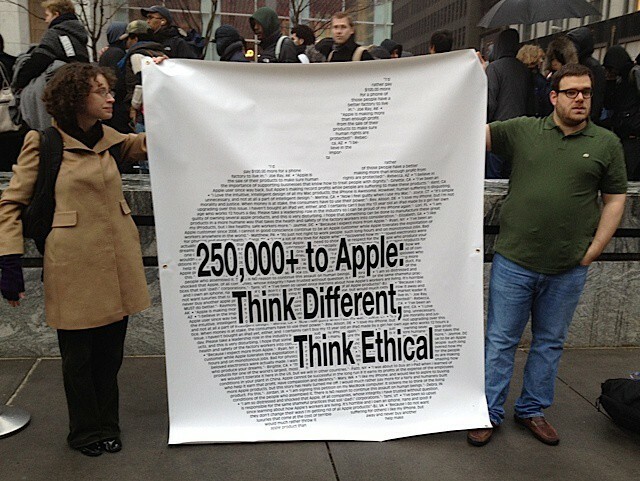 The original petition calls for Apple to protect the Chinese workers. Apple is already doing so and continues to do so. It is redundant. You might as well petition the ocean to be wet. If working at a Foxconn factory making products for Apple (and others) was such a bad thing, I doubt you’d have long lines of applicants begging to be abused. CoM: You say Apple is already doing more for worker rights in China than other IT companies – if Change.org agrees to pull Mark Shield’s petition, would you consider launching another one about all the global tech companies who do business there or not, and why? PD: If Mark’s petition is recalled then my petition will have done what I created it for. If I make another petition, it would likely be to petition our governments for fair copyright law. The entertainment lobby seems to have the politicians in their back pockets. They want us to pay extra to put our DVDs onto our iPads! They claim to have lost more jobs to file sharing than they have ever created! We could use a good dose of truth in that debate. CoM: Some of your petition signers say they are “angry” or “saddened” by what happened with the TAL fiasco – what was your prevailing emotion when you posted the petition? PD: My main motivation for starting this was simple: If the original petition was because of Mike’s appearance on This American Life, and that show was retracted, then the petition should also be retracted. I also couldn’t help but have fun with the recursive nature of creating a petition at Change.org to ask Change.org to recall a petition. Even if the petition were to remove references to the story on This American Life, I still think it is redundant. You can read about what Apple has been doing since before Mike Daisey went to China here. This stuff isn’t new.